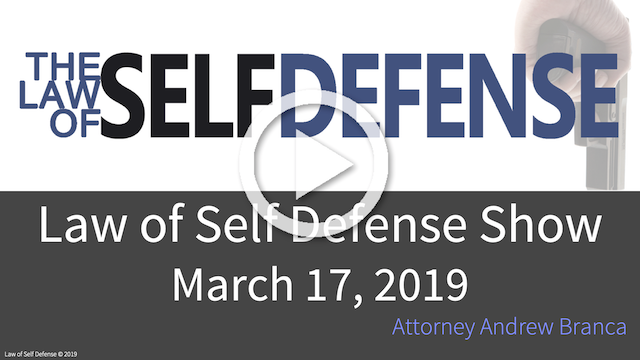 This week’s “Law of Self Defense Show,” with the topic “Prioritizing Your Self-Defense Resources” is now available for viewing at lawofselfdefense.com/blog! The “Law of Self Defense Show” is FREE to LOSD Members, and Bronze-level membership is FREE, so I urge you to learn about membership at lawofselfdefense.com/join. Programs serve as a good review. Thanks I have your book and other training DVDs. Never had any formal training. I do study tactic information and do my own little move, draw, rack, shoot routines. That besides just fun target shooting. No volume. Yes, I know how to work volume controls. Volume works just fine for me, haven’t had any other complaints. I couldn’t agree more with those priorities you’ve laid out, Mr. Branca. Particularly, IMO as well, that once priority #1 is achieved, priority #2 is an absolute necessity. After I had taken lawful possession of #1 it was very soon that I realized just how much legal liability having #1 brought with it t me. I not only sought out proper #3 but scrambled to find some valid, expert priority #2. Thank God for the likes of Andrew Branca and his superb tuition! I generally agree with the priorities. However, I would insert knowledge of gunshot wound first aid and possession of a basic trauma kit as priority 1.5, part of surviving the physical fight.